We’re down to the wire. On Wednesday, the Senate will vote on SB 234. This bill includes open carry, vehicle carry, DOACS fingerprint authorization, and long gun/shotgun contiguous state purchase authorization. Of course, the most contentious element is open carry. This is going to be a squeaker, folks. By now, the Senators should have already made up their minds. Nonetheless, Florida Carry is requesting one last push to deliver this baby. We’ve shown the untruthful (and perhaps unlawful) tactics used by the various Sheriff’s offices and the Florida Sheriff’s Association that has spurred an official investigation by the State Attorney’s Office, FDLE, and OCSO internal affairs. Pinellas County Sheriff Coats told the committees his speculation on open carry, then admitted that he hadn’t researched how open carry works in any other state. The deputies of the Hillsborough County Sherriff’s Office pulled over and detained a licensed concealed carrier just a few days ago for “printing” of his lawfully carried firearm despite their Sheriff’s testimony to the legislature that his officers would never do such a thing. The fact is that, not a single opposition speaker has ever addressed how so many other states could have open carry without the doom and gloom consequences that they espouse. Is it coincidence that the same predictions were made in 1987, by the same organizations, with regards to shall-issue concealed carry? Please take a moment and fire up your e-mail clients one more time. Thank you for your continued support, and with any luck, we’ll be seeing you at an open carry picnic sometime in the near future! Feel free to use the e-mail helper below, and thank you again for your solid support. We’re almost there, and we just need a final push to get this bill to the Governor’s desk for his promised signature. Senate Bill 234 deserves your support, as do the 801,219 active concealed carry licensees who have patiently waited for this bill for over 23 years. Governor Scott has already stated he will sign the bill as a 2nd Amendment supporter and open carry advocate. Florida is one of only seven states that do not permit some form of general open carry. The objections raised by law enforcement and retail associations make no mention that the practice of open carry is successful in 43 states, nor do they acknowledge their dire predictions are the same “blood in the streets” arguments of almost a quarter-century ago. Those predictions have been proven unfounded. Please review the press release included below. Senate Bill 234 will meet the Florida Senate Rules Committee on Friday, April 15 at 9:15 am. We request that you send this to the members of the committee. Please copy and paste everything below into an e-mail to the committee members. SUBJ: Support SB 234 – Don’t give in to the same forces that fought us in 1987. When you cast your vote on Friday, please consider the realities of open carry and do not give in to the emotional and misleading speculation designed to persuade you to make a bad decision. Please vote in favor of SB 234. Florida Law Enforcement Officers Push the Limit to Stop Open Carry Rights Bill. The main provision of Florida Senate Bill 234 would, for the first time since 1987, permit concealed weapon or firearm license holders to carry handguns openly. On Tuesday, the Senate Judiciary Committee heard testimony regarding the bill. Hillsborough County Sheriff’s Office Major Ken Davis told of a recent traffic stop of six Tampa Bay Outlaw motorcycle gang members. “Although the six Outlaws were certified gang members, and had histories of criminal arrests, most were also concealed carry permit [sic] holders”, he related. According to Florida Statute, the Department of Agriculture and Consumer Services must suspend the licenses of those persons arrested or formally charged with a crime that would disqualify an individual for a license until final disposition of the case, and a licensee who is under an injunction that restrains them from committing acts of domestic violence or acts of repeat violence. Finally, the agency must revoke the license of a licensee who has been found guilty of, had adjudication of guilt withheld for, or had imposition of sentence suspended for one or more crimes of violence within the preceding three years. One must conclude that Major Davis was either embellishing the facts surrounding the criminal arrests of the certified gang members in order to sway the committee, or his department was derelict in not reporting the disqualifying arrests to the Department of Agriculture and Consumer Services for suspension of the licenses of those involved. Florida Statute 790.0601 expressly forbids the release of personally identifying information of a person who has applied for or who has received a license to carry a concealed weapon or firearm. The specific circumstances in which that information may be released are with the express written consent of the licensee, by a court order upon showing a good cause, or upon request of a law enforcement agency in connection with performance of lawful duties. There is no exemption for release of identifying information by anyone for the purposes of furthering a political agenda. Outright misrepresentation of fact appears to be a tactic our sheriffs are willing to utilize to defeat SB 234. Volusia County Sheriff Ben Johnson testified that open carry would be evident in the stands at next year’s Daytona 500 auto race. Conveniently, Sheriff Johnson omitted the fact that carry at a professional athletic event is a violation of existing statute, and Daytona International Speedway is a privately owned facility and has the statutory right to have anyone trespassed from the property for any reason, including carry of open or concealed firearms. Finally, and perhaps most importantly in these times of fiscal austerity, were any public funds utilized to oppose the expansion of Second Amendment rights on behalf of the Florida Sheriffs Association? Although elected officials, like the sheriffs are exempt, statute forbids anyone else to be compensated for lobbying without being registered as a legislative branch lobbyist. This means that if any non-elected law enforcement officers were compensated for in any way, by any public or private entity, they very well may have been in violation of law. Were any publically owned vehicles used for travel? Did any of the officers use per diem allowance or stay overnight on the taxpayer dime? And how many were on the clock? But even if on their own dime, was it ethical to then wear their uniforms and, ironically, their firearms to the committee meeting? 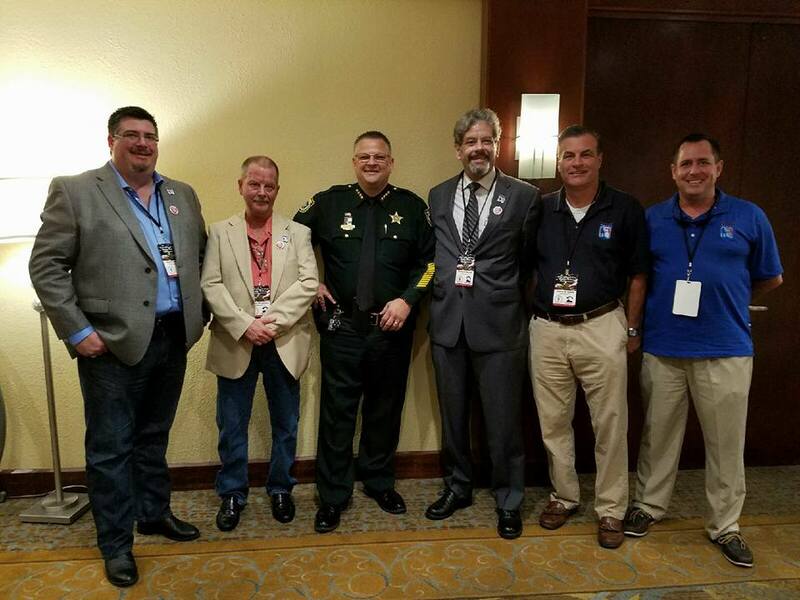 It is apparent that member agencies of the Florida Sheriffs Association may be willing to embellish circumstances, bend the law, and intentionally misrepresent facts in order to influence the committee and the legislature at large in order to maintain their virtual monopoly on open carry. Ironic since in 1987, when shall-issue concealed carry was being debated, the same association stated they preferred open carry over concealed carry so their deputies would not have to guess at who was armed. About: Florida Open-Carry.org is a grass roots movement of Florida residents who endeavor to raise awareness in the community of our second amendment rights. Our primary goal is to help educate others about their right to legally open carry and advocate for repeal of the general ban on open carry in Florida. Florida is one of only seven states where open carry is generally illegal. As most of you know, SB 234’s two primary elements, open carry and campus carry, have been gutted by committee amendments. These amendments were proposed, accepted, and integrated into the bill without public comment or discussion. On February 22, 2011, the father of Ashley Cowie, the FSU student who was killed in an off-campus incident, presented an impassioned plea against the campus carry element of SB 234. Ashley was killed by a student who was too young to get a concealed weapons/firearms license (CWFL), allegedly was under the influence of drugs and/or alcohol, negligently mishandled a rifle too large to carry concealed for self-defense purposes, at an off-campus frat house at which weapons were prohibited. The campus carry initiative has nothing in common with this tragic event, and the current ban on lawfully carried firearms did not prevent it. In fact, there are 71 campuses in the U.S. where concealed carry is permitted, some of which have been doing so since 1995, and not a single gun-related event has occurred on any of those campuses. But the amendment to kill campus carry was passed by the committee without them hearing these facts because not a single proponent of campus carry was permitted to address them prior to the amendment’s adoption. No debate, no discussion was permitted. Ironically, after the amendment was adopted, a college law enforcement administrator wasted time allotted to public discussion to continue opposing the already dead element. Likewise, the open carry element was saddled with an amendment that demanded impractical and unnecessary requirements that no other open carry state in the union, including California, requires. The requirements are for firearm retention training, a level-2 retention holster, and public display of one’s license in proximity to a firearm being openly carried. The retention training requirement is not realistic for a number of reasons. First, no other open carry state has such a requirementsince there is no evidence that there is any substantial threat to open carriers of being relieved of their firearms by criminals. It simply isn’t happening anywhere else. Law enforcement will maintain that their officers must undergo such training because of numerous incidents of fellow officers being killed by their own firearms. But they conveniently forget that these incidents result from the officer’s duty to initiate contact and apprehend nefarious types, often violent felons who have no desire to get sent to prison. No such duty exists with citizen open carriers, and there is little motivation for the felon to initiate contact with an armed citizen when so many unarmed potential targets exist. The requirement for a statutorily undefined level-2 retention holster again stems from this unsubstantiated and purely speculative assumption that an armed citizen is a ripe target for a criminal. Again, no other open carry state requires this because there is no evidence to support a threat. Indeed, if there was ever a candidate for mandatory wearing of a retention holster of any type, it would be for a law enforcement officer. There is no state requirment that police use a level-2 retention holster. Also, by requiring a citizen to only open carry in a retention holster does not address a very basic function of the open carry initiative; that being the ability switch from concealed carry to open carry at will depending on conditions. For example, a CWFL holder carrying in a standard in-waistband holster concealed under a light jacket would not be permitted to remove his jacket. Furthermore, level-2 retention holsters are not available for many popular makes and models of side-arms. Many gun owners will not be able to open carry their side-arm because no manufacturer has marketed their holster as a "level-2". Finally, the requirement to display one’s CWFL in public would again, only exist in Florida. Law enforcement has universally discouraged CWFL holders from the use of badges, as this could cause the public to mistake them for officers. There is no reason to believe that the mandatory display of licenses would not be likewise mistaken for police identification. The Supreme Court of Florida has ruled that the mere possession of a firearm does not suffice as reasonable suspicion for the purpose of detention, identification, and search of citizens, yet this requirement sidesteps the concept of reasonable suspicion/probable cause and in fact, authorizes police to question law-abiding citizens under the guise of “verifying” carry credentials. Florida statutes do not require CWFL holders to identify themselves to law enforcement for this very reason. It is also quite ironic that in light of this committee’s passage of SB 604, the bill which permanently exempts CWFL licensee data from release under so-called “sunshine laws”, the public display of a licensee’s name, and on some licenses their home address, for all to see. The true purpose behind this amendment is clear. Having no real substantiated reason to deny open carry, certain groups and individuals instead are attempting to make the practice so burdensome as to either discourage the vast majority of CWFL holders to participate in open carry, or to make the open carry initiative itself so unpalatable to proponents that it would soon die due to lack of interest. And again, as with the arguments for campus carry, these facts were not permitted to be presented to the committee prior to adoption of the amendment requiring these unrealistic requirements. Through two entire sessions of the committee, the SB 234 supporters were afforded a single, 30-second time slot by a single individual, and this occurred AFTER the amendments were approved by the committee. This is intolerable and surely flies in the face of the concept of representing the people. We ask members and non-members alike to e-mail, write, and call the Senate President Mike Haridopolos, and express your outrage over the actions of the Senate Criminal Justice Committee. There is ample documented evidence to support SB 234, and nothing but unsubstantiated opinion against it. Procedurally, it is a travesty that amendments are adopted without public discourse, which has a direct bearing on said amendments. We urgently need you to email Senator Haridopolos NOW! Please help us get SB 234 through committee! This e-mail is to express my outrage as to the procedural conduct of the Senate Criminal Justice Committee with regards to the gutting of Senate Bill 234 without the benefit of public discourse. An ill-conceived amendment to the proposed open carry legalization was passed by the committee without a single word from the public prior to its adoption. Each and every element of the amendment can be factually argued, but no argument was permitted whatsoever. Despite two committee meetings addressing the bill, which still has not yet been voted upon, the supporters of SB 234 have been permitted a single individual to speak for a total of 30 seconds. 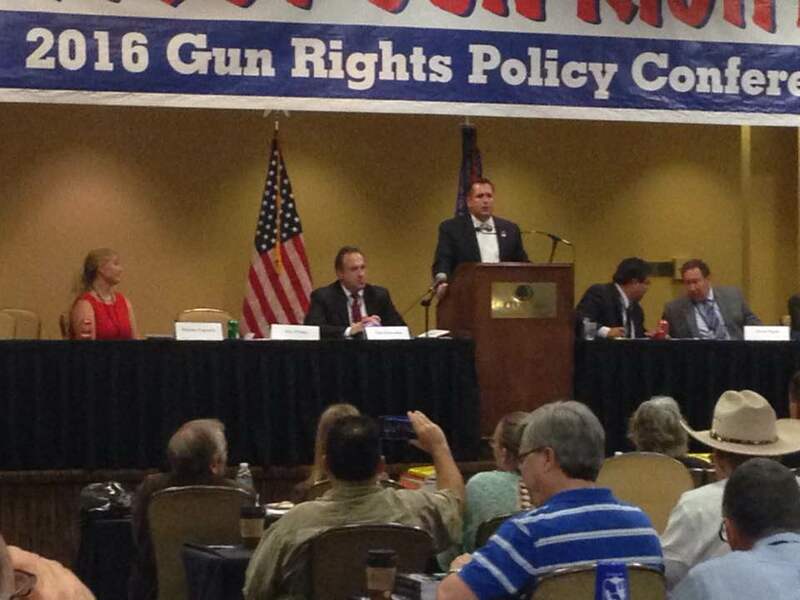 Florida Open Carry Movement members from across the state were gagged in the audience without the opportunity to speak. This is a travesty, and only supports the notion that the committee is not interested in hearing arguments in favor of the bill for which they have no rebuttal. We request your assistance in getting a SB 234 through committee and to the Senate floor where both sides will have the opportunity to present verifiable and documented facts, without the procedural maneuvering that is clearly picking apart this good bill. Late today, Sen. Ellyn Bogdanoff (R-Fort Lauderdale), introduced a committee amendment to SB 234. This bill meets the Judiciary Committee tomorrow at 1PM. Sen. Bogdanoff is a member of this committee, and early on in the bill’s life, expressed reservations about open carry. She is now carrying through with an attempt to kill open carry. The amendment, although looking innocuous enough, makes inadvertent exposure exempt from the prohibition of open carry in §790.053 Florida Statutes. However, the issue of inadvertent exposure is moot if the open carry bill is passed. It is apparent that this is a prelude to a floor amendment that would remove the open carry provision entirely in favor of this amendment language. We urgently request you IMMEDIATELY e-mail the committee members and demand that they do not adopt, and demand that Sen. Bogdanoff immediately withdraw this open carry unfriendly amendment as a slap in the face to the law-abiding concealed carriers. Apparently, we cannot be trusted to decide for ourselves where and when open carry is appropriate despite almost a quarter century of impeccable behavior under the concealed carry statute. Withdraw/Reject Anti-Gun Amendment to SB 234! Sen. Ellyn Bogdanoff has proposed a committee amendment, inserting language that would amend §790.053 F.S. to exempt inadvertent exposure of a firearm by licensed concealed carriers while carrying concealed. This amendment must be withdrawn or rejected immediately, as it is clearly a prelude to removing the open carry provision of SB 234 in its entirety. Neither the membership of Florida Carry, nor concealed carry license holders in general, will tolerate this attempt at destroying open carry. It is something that the license holders have not had the opportunity to do since 1987, and it is something they have earned through their faithful, law-abiding behavior for almost a quarter century. As of March 31, 2011, over 1.95 million licenses have been issued by the Department of Agriculture, with only 168 being revoked for misuse of a firearm. Does that not prove beyond a shadow of a doubt that license holders are responsible? Senator Bogdanoff, you represent portions of Broward and Palm Beach counties. Those counties comprise 116,151 out of 801,219 active license holders in Florida, who will not forget this come election time. SB 432 is on the agenda of the FL Senate Committee on Criminal Justice on Tuesday, February 22nd at 9:00am. Florida Carry, Inc. urgently requests that the membership call the phone numbers below and/or send e-mails via the links provided to each of the members of the committee in support of Senate Bill 234. The NRA authored bill prohibits medical personnel from inquiries regarding gun ownership, prohibits refusal of service based on gun ownership, and affords penalties for offenders. The American Medical Association and American Academy of Pediatrics have embarked on a path of gun control activism. Long aligned with anti-gun proponents, they now encourage their members to ask about the presence and storage of firearms from both patients and their children and to record the responses. Refusal to provide such information by the patient may be met by refusal of service. Basing service on whether or not one practices of a constitutionally-protected right is discriminatory. Creating a "gun registry" violates statute. Interrogating children is deplorable. Florida Carry, Inc. supports SB 432, and encourages its members and all gun owners/carriers to join us in contacting the Senators Criminal Justice Committee. Here's a link to the Senate version of the bill. This e-mail is to express my support for Senate Bill 432, Privacy of Firearms Owners. As a member of the Florida Senate Committee on Criminal Justice, you will be hearing this bill on Tuesday, February 22nd. I respectfully ask that you wholeheartedly support this bill. Throughout Florida, doctors and office staff are asking patients and their children if guns are present in their household. Those who reply have the answers recorded on a computer or on paper. Those who don't reply, in some cases, have been refused service. The American Medical Association and the American Academy of Pediatrics are actively imposing their agenda against firearms and violating patient privacy in the process. The California Supreme Court ruled this month that a retailer may not ask a customer their zip code, declaring it a "violation of privacy". Surely "does daddy or mommy own a gun" and "where do they keep it" should be afforded that same protection.